None of this snow was there Friday afternoon. This is what our block looked like early Saturday afternoon. The saint is the guy on the block with a well-running snowblower. We heard him go by at about 7 am. Most of the time, I get kinda cranky when someone is running noisy machinery that early on a Saturday morning. But I knew what he was up to, and went back to sleep with a feeling of intense gratitude. This illustrates one of my favorite things about life in small-town Wisconsin: Neighbors look out for each other. Our lots are fairly narrow, so unless one lives on a corner, we are only responsible for about fifty feet of sidewalk. 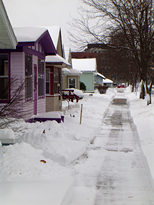 After a small storm, the first one out with the shovel usually clears the neighbor’s sidewalk as well as his/her own. When the snow is a foot or deeper, clearing that fifty feet of sidewalk by hand is daunting. Mind you, it’s doable, but it’s not the trivial chore presented by lesser storms. But there always seems to be one person on every block with a well-run snowblower who finishes his fifty feet of sidewalk in about five minutes, and decides that it’s not that big of a deal for the well-oiled machine to do the entire block. As it was, I spent about an hour re-establishing access to our back door, and carving a minimal path to the garage and the alley. So the saint down the street made sure nobody on the block would get fined by the city, but I was left with a lot of work to make our yard functional. By the way, we woke up to about 12 inches. It let up long enough for the city to pile snowbanks four feet high between our houses and the street. As I write, the weather service has cancelled the Winter Storm Warning. Now we have a Blizzard Warning. By morning, that nice clean sidewalk should have another 10 inches, or the wind will replace everything we moved out of the way with snow drifts, or both. So the most depressing thing is that tomorrow we get to repeat the shoveling we did today. This entry was posted in Climate, Community. Bookmark the permalink. “unless one lives on a corner”… oh hardy hardy har. I hope this doesn’t wreck the mystery for you… but IT WAS SHELDON! So, Jess, did you tell Sheldon that I called him a saint?